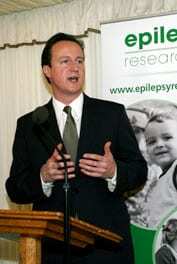 On 28 November 2007, Epilepsy Research UK was officially launched by our Trustee, the Rt Hon David Cameron MP, at the Palace of Westminster. Watch the video below to hear David’s own experience of epilepsy research. Also amongst the guests at the event was actor Sam Reilly, who talks about his portrayal in the film Control of Ian Curtis, the lead singer of Joy Division, who had epilepsy.